I simply can’t tear myself away from the Pinterest. So when I saw this beautifully illustrated cinnamon roll pancake situation, I was all, “I’ll nail that!” So I woke up the kids, told them the good news and we proceeded to have the most amazing Saturday morning of all time. Cute, no? Recipe Girl suggests you steer clear of the pancake edge when you’re adding your cinnamon mixture, otherwise it could wreck the whole thing. But I’m guessing, even if wrecked, these would still be totally delicious. Although we have decided the amount of sugar means we can only eat these once a year. Only 363 more days before we can enjoy the crap out of these dessert pancakes. Yes, I am counting the days. You too, can o.d. on sugar in the morning! 1. Prepare cinnamon mixture—Mix melted butter, brown sugar, and cinnamon together in medium bowl. Transfer to icing bottle or Ziploc bag and set aside. 2. Prepare icing—Melt butter over low heat. Add cream cheese and whisk together completely. Add powdered sugar, 1/4 cup at a time and whisk until completely mixed. Add vanilla and mix. 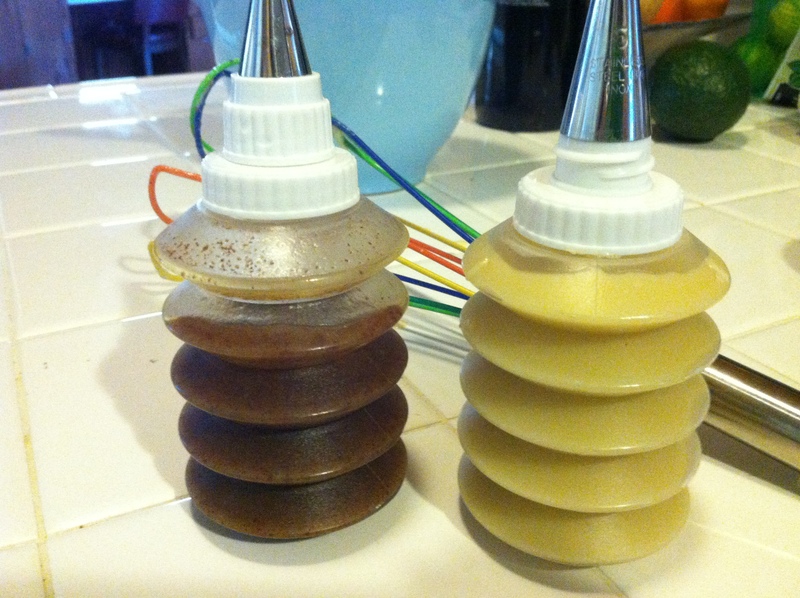 Remove from heat and transfer (when cool) to icing bottle or Ziploc bag. 3. Make pancakes according to instructions and heat oil on griddle. 4. Pour 1/3 cup—or even more—pancake batter on the griddle and let cook for 20 seconds before creating a winding circle of cinnamon mixture inside. Flip after pancake has lots of air bubbles and bottom is browned on one side. 5. Stack pancakes on top of each other, and use icing bottle or Ziploc bag to create cinnamon roll stripes or circles on the top pancake. ENJOY. 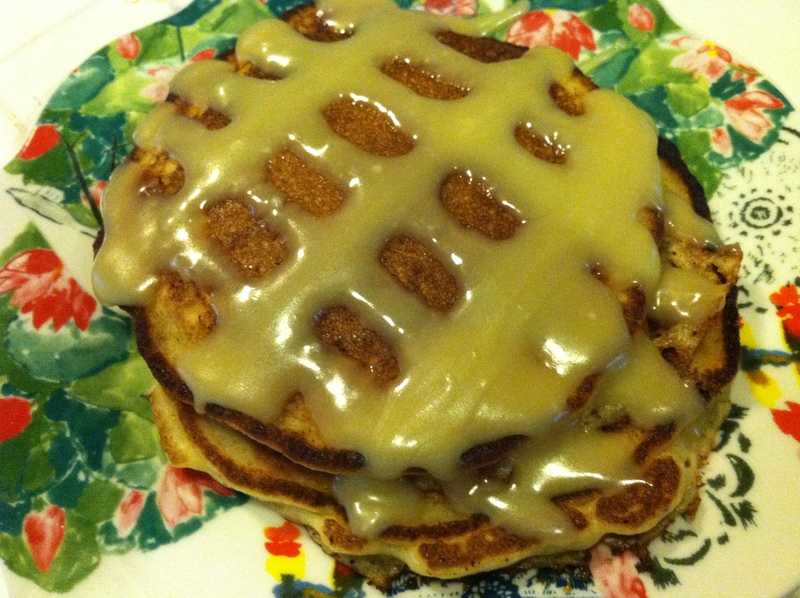 Tags: gluten free junk food, gluten free recipes, gluten-free pancakes, pinterest. Bookmark the permalink. Previous post ← Gluten-Free Burrito Night!!!!! I just joined the evil siren Pinterest a couple weeks ago and wrote a post about it today, ha! Adding this to my pancake board (um, that’s right, I have a pancake board). This looks so yummy! I love Pinterest. If only I tried a fraction of the things that I pin! Ohhh…. Looks so tasty. 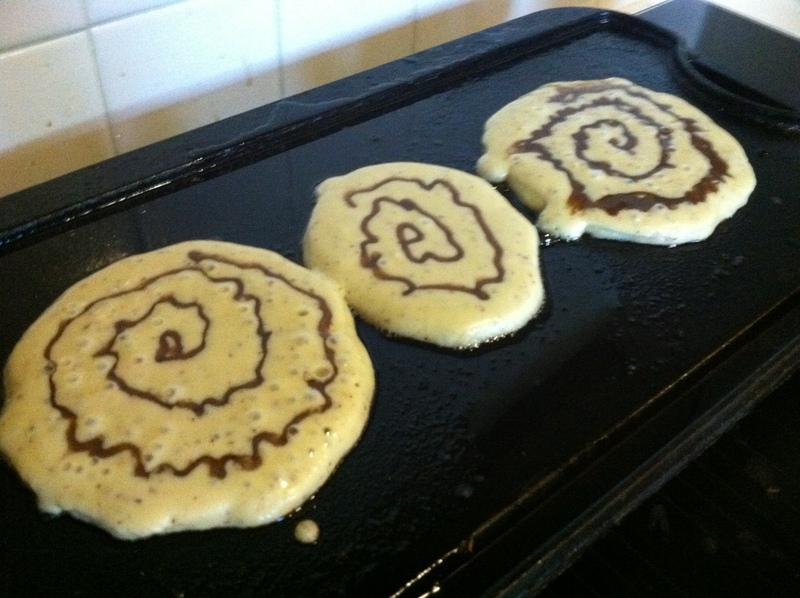 I just recently found out about this method of pancake making, where you can draw things on the pan with icing bottles. Imagine a cool cinnamon swirl sun or a smiley face? I would eat that. Totally.